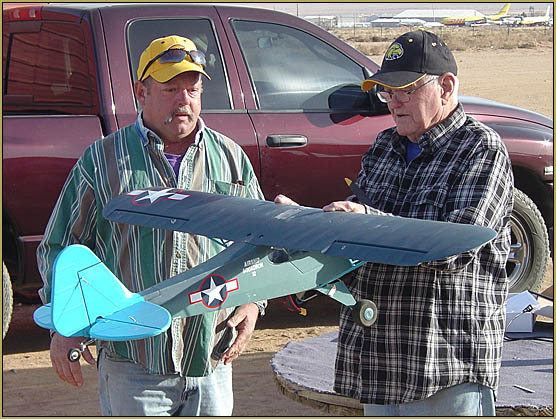 2018’s Golden Eagle RC Club “Most Improved Pilot” award winner: Worth Weant… getting a few pointers from our Shawn Lavery. Worth and one of his E-gliders… a Gentle Lady?? 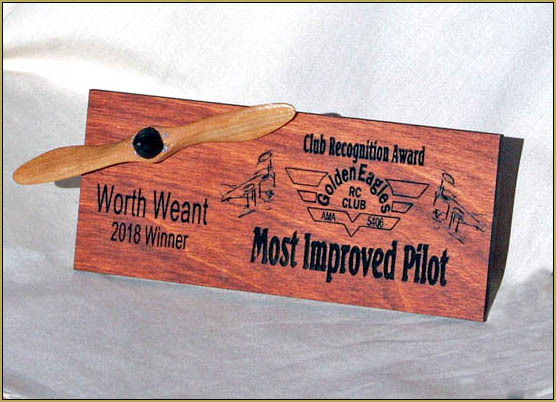 Worth Weant has been awarded the “Most Improved Pilot” Award for 2018. Worth began learning to fly back in September of 2017. He enjoyed flying electric gliders… and his enjoyment was infectious; developing into a dedicated “glider group” of Eagles! 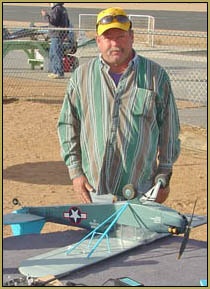 Worth also flew-the-spots-off of his blue Cub model. It was a tough transition from his having learned to fly the E-glider to learning to fly this little foamie Cub… but he kept at it and could be seen, out there, driving that plane all over the sky. That model took more than its share of abuse… but Worth showed it no mercy! Good going, Worth! … So sorry you have moved out-of -state but glad you are still a member of the Eagles! … I know you are in touch with our Pauly Forsyth… and we hear that you may be coming back to Kingman… Looking forward to it! 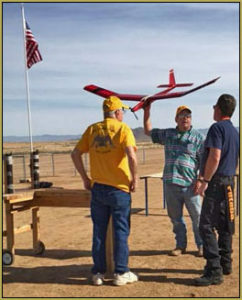 ← Golden Eagles RC Club’s 1st Birthday Bash was a Blast! I am humbled, by my award, and the plaque, ie award, is first rate, and it will find a prominent place in my tiny shack, up here in extreme north west, Washington. I’ve, never won anything, and am extremely proud of the award, even though I live here in WA. I knew I would be coming back and had intended to renew my Golden Eagles membership, been here 4 months, and have not joined the local club yet! Great club, good people, but they don’t have the peanut gallery… not as fun… and it rains every day I’m off work! I’ve never met a better group of people, men and women, than the Golden Eagles. When I started, after I showed every one I was serious about learning to fly, everyone did everything to help me, and give me advice, and help. Montana gave me a Gentle Lady sail plane when I crashed mine. Shawn, gave me a sail plane, Dave Duke gave me a bi-plane, Jon offered to give me a sail plane, and a high wing… and I forget his name, built my Czechoslovakian sail plane for me, and more! But to heck with the planes, it’s the people! … and when I come back, in Jan? ?, because I have not flown in 4 months, I want Pauly, to be my re-trainer, now, go figure that one out! He’s just not allowed to talk, while I’m flying, hy, hy, Thanks again!